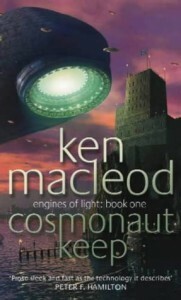 After “The Sky Road” finished off the “Fall Revolution” series MacLeod decided to switch universes, starting afresh with his “Engines of Light” trilogy. It kept many of the characteristics of his earlier books – political content, sophisticated computer technology, Scottish settings – but added on new elements, many taken from the “space opera” genre. Unlike the largely stand-alone “Fall Revolution” books, the “Engines of Light” series was a genuine trilogy, with all three books having to be read before a conclusion was reached. The first book is, like “The Stone Canal” and “The Sky Road”, split into two separate plot threads. The first follows computer programmer (a common occupation in MacLeod's books) Matt Cairns who lives in a near-future Edinburgh (living in a near-future Edinburgh is also common in Macleod’s books). In this timeline Europe has been conquered by a resurgent Soviet Union, with the US looking on uneasily from across the Atlantic. As news breaks that a Russian space station may have made contact with an alien entity, Matt comes into possession of a datadisk of unknown origin, which may somehow be connected to the alien contact. Matt flees from the authorities, travels to America and eventually ends up on the Russian space station as the cosmonauts there are faced with a couple of dilemmas – should they bow down to pressure from their Earth-bound political masters and should they build the interstellar drive that the aliens have seemingly given them the blueprints for. The second plot thread takes place on the far-off planet of Mingulay. It turns out that many star systems have populations of alien organisms that inhabit asteroids. These organisms are tiny, but exist in vast numbers, with the effect that each asteroid has a superhumanly intelligent group mind. These group minds are superstitiously referred to as “Gods” by lesser races, quite appropriately since the Gods frequently interfere in the affairs of the underlings, for their own inscrutable purposes. One of these purposes involved kidnapping groups of humans throughout history and relocating them on far-off planets, such as Mingulay. This kidnapping is performed by the Saurs, an alien race physically similar to the 'Greys' of popular flying saucer myths, although the Saurs are more peaceful and benevolent than Hollywood would usually portray the Greys as being. The main character in this plot thread is Gregor Cairns who is – as his surname might suggest - a distant descendent of Matt Cairns from the other plot thread. He is heir to a project that has operated in his family for generations – to try and master the secrets of interstellar navigation and be the first human-built vessel to travel to another planet in centuries. However, this will not be easy, and requires persuading the Saurs to release some of their technology – something they are very reluctant to do. There is also a surprising discovery when he realises that his ancestor Matt is still alive – despite the passage of centuries. As always, the quality of the writing is good, however the plot itself doesn't work quite as well as some of the MacLeod's other novels. The book suffers from being the first book in the series and it's difficult to really understand the full meaning of some of the events in the book without having read the rest of the series. The background of Mingulay, and the several alien races featured in the book, is also not described in enough detail here to really appreciate fully at first what is occurring. These problems are largely nullified by reading the next two books in the series, but the premise could still have been introduced better. While Mingulay may be occasionally difficult to understand, the near-future Europe setting seems a bit over-familiar from MacLeod's “Fall Revolution” series. Although the events are different in this book, there is a certain feeling of “seen-it-all-before” about the earlier parts of that plot thread. Throw in some fairly bland characters, and the end result is one of MacLeod's weaker novels. In summary, it may not be the best of MacLeod's work, and it may feel incomplete on its own, but MacLeod on an off day is still better than many other science fiction authors at their best.